In most places a well must get ‘approved for use’ by a certified laboratory before a home or business owner may begin drawing water from it. Also, in a lot of places, a property cannot change hands without a certified test proving that the well intended to provide the property with water does not contain coliform bacteria or other harmful things. But, did you know that in many states, once a well receives the official ‘OK’ from a certified lab, they do not have to get check again — possibly EVER? Most states do NOT require well owners to have their water tested once it passes an initial test and all responsibility for illness, death or disease caused by the consumption of water from that well falls on the shoulders of the well owner. As a general rule, Health Officials and Water Quality Professionals ‘suggest’ that well owners test their own well water (or have it tested) at least once a year. Why do health officials and organizations suggest well water testing on a yearly basis? The level of water in the aquifer where a well draws its water from changes frequently with large amounts of rainfall or extended periods of drought. As it changes it possibly picks up new contaminants that form when certain types of rock either get exposed to oxygen or, in some cases, water for the first time in a long time. As an example, Free Dissolved Arsenic can enter an aquifer after igneous (volcanic) rock gets covered back up by water after exposure to oxygen during a previous period of drought. A well owner would not know of a potentially harmful arsenic level in their well water unless they tested for arsenic periodically. 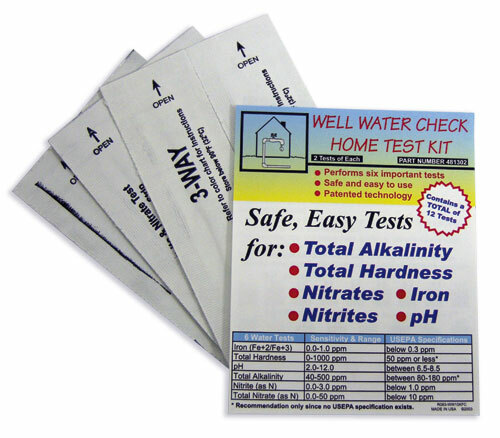 Want more information on arsenic in drinking water and arsenic in water test kits? Take a look at www.ArsenicQuick.com. Can Well Owners Test Their Own Well Water Accurately and Easily? Absolutely! 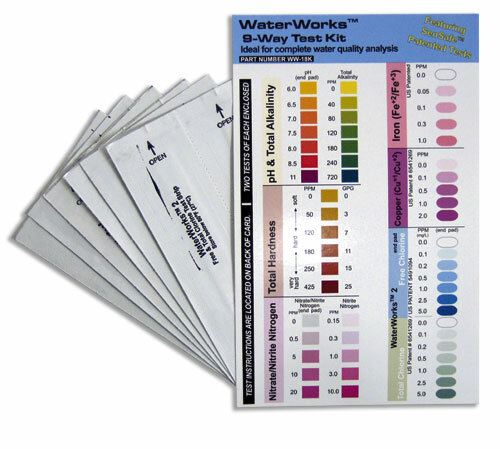 Innovations in test strip technology from companies like Industrial Test Systems, Inc. (SenSafe) have made at-home well water testing as simple as dipping a strip in a sample of the well water, removing it, waiting a few seconds for colors to develop, and then comparing the color(s) of the test pad(s)/area(s) on a provided color chart. 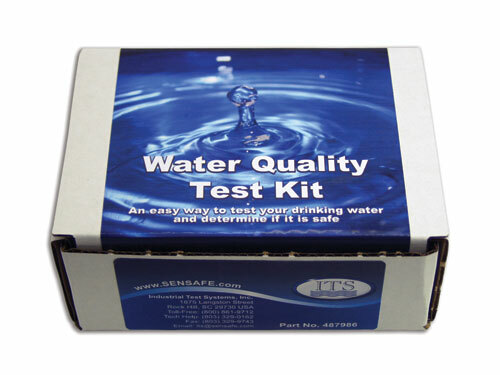 And finally, for the well owner who wants to test their own well water as thoroughly as possible without having to buy electronic meters and/or send their well water out for certified laboratory analysis, you have the recently released Water Quality Test Kit. It may have a simple name, but it packs a powerful well water testing punch: 2) tests for Iron, (2) tests for Copper, (2) tests for Chloride, (2) tests for Nitrate/Nitrite as Nitrogen, (2) tests for Total Chlorine, (2) tests for Total Hardness, (2) tests for Free Chlorine, (2) tests for Sulfate, (2) tests for pH, (2) tests for Total Alkalinity, (2) tests for Hydrogen Sulfide, (1) Pesticide in Water test, (1) Lead in Water test, and (1) 48 Hour Presence/Absence test for Coliform Bacteria. 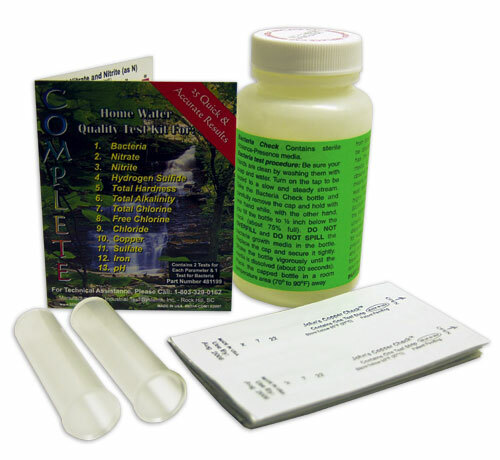 If you’re looking for a do-it-all, do-it-yourself home water test that won’t break the bank, you should definitely take a long look at the aptly named Water Quality Test Kit — MSRP of around $34 USD. So there you have it, folks. . . Several fast, accurate and easy ways to test the quality of your water that won’t break the bank or require you to break out your old high school Chemistry book or borrow your son or daughter’s Chemistry book. As usual, we suggest you visit the United States Environmental Protection Agency Safe Drinking Water for a detailed list of acceptable contaminant levels in potable water. We have also taken the liberty of posting/linking both the Primary Drinking Water Standards and Secondary Drinking Water Standards on this site.